Ashford Hollow is a small community consisting of 225 one and two story single-family homes nestled in west Houston. Residents have access to a community swimming pool, tennis court and gated playground. Because we are a small community we have a small town feel where you can easily get to know your neighbors. We are part of the Houston Independent School district with Ashford Elementary (pre-K through 2nd grade) and Shadowbriar Elementary (3rd through 5th grade) within walking distance, and West Briar Middle and Westside High schools are a short drive west of the neighborhood. 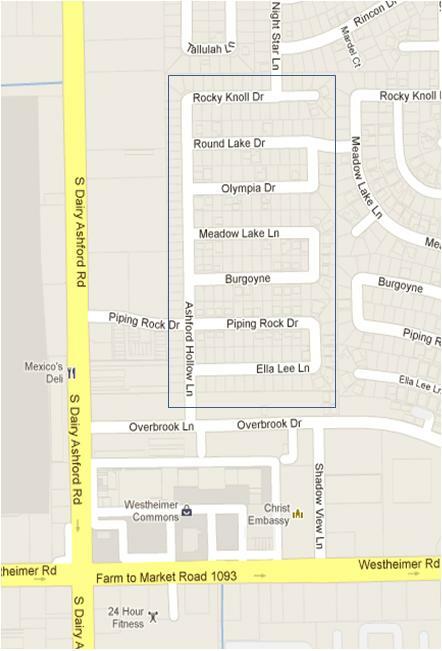 Ashford Hollow is conveniently located north of Westheimer between Dairy Ashford and Kirkwood. You’ll love our close proximity to the Westchase Business District, I-10 Energy Corridor, Town & Country and Galleria areas. We offer a great location for shopping with West Oaks Mall (3 miles west), Memorial City Mall (5 miles north-east) and the internationally known Galleria Mall (less than 10 miles east). We’re excited that you’re here at our NEW website and have an interest in knowing more about what’s going on in our community. Be sure to check back often as we post more information about upcoming events, items of interest to the neighborhood, calendar of events, security reports and information from the Board of Directors. There are areas on the website that are for residents only and you will need to register to access these areas. To join and become a member, please visit the SIGN-UP PAGE and follow the instructions. Only homeowners and residents of the Ashford Hollow CIA can join. Your name and address will be verified and you will be notified via email with approval. If you are visiting our website, we extend our warmest welcome! After you tour our website, we hope that you’ll take a personal driving tour of our neighborhood; then you’ll know why we call Ashford Hollow our home. So what are you waiting for - make Ashford Hollow your home today.